When I was in college, I spent much of my time studying, but each Friday night, when I came to that quotation in the prayer book, I would pause and think. While I busied myself with my studies in math, history, and literature, I did not make time for Jewish study. Each week it kept falling further down my priority list. In fact, I graduated from college not having taken a single Jewish studies course (although I did manage to do some studying with the Hillel rabbi). When we do not set aside time for something, it often does not happen. As we know, leisure moments can be few and far between. If you are looking for more opportunities for Jewish study, mark your calendar and make a commitment. Not only will it be engaging and interesting, it will be delicious! I was recently asked by a community member if I travel a lot for work. My initial reaction was to say no, but upon reflection I realized that I do travel quite a bit. This past month, I attended the Biennial of the Union for Reform Judaism in Boston. In addition to hearing inspiring speakers and attending workshops on everything from leading worship to teaching tots, I went there to receive the 2017 Fain Award on behalf of Temple Beth El. We were one of only 17 congregations across our movement to be recognized for our social action programming, specifically for our work with the Capital Area New Mainers Project. In January, I will be travelling to Washington, D.C., with five Temple teens to take part in the L’Taken Seminar. We will join with others from across North America for four days of learning what Jewish values say about national issues. We will tour Washington, including the Holocaust Memorial Museum. After researching an issue, students will lobby our senators and representatives (or at least their staffs) on Capitol Hill. You’ll hear more about this trip through our Facebook page, in a future newsletter, and when our teens speak at the Temple about their experiences. I also am travelling regularly as part of my work on the board of the Central Conference of American Rabbis. It is an honor to serve and to bring the voice of small congregation rabbis to our national body. I am particularly proud of two initiatives the board is undertaking. After conducting two intensive studies, we are beginning to discuss how to address issues of isolation and stress in the rabbinate. We have also established a Task Force on the Experience of Women in the Rabbinate to better understand and to begin to address issues of gender bias. This does not even include my travel around our state to meet with rabbis and congregations in Portland and Bath to talk about the Center for Small Town Jewish Life and our upcoming conference (mark your calendars for June 8th through 10th!) and my travel up to Colby College to work with the Jewish students there. Don’t worry. Despite all this traveling around you will still find me in the office or around Augusta most days, and I have plenty of time to meet with congregants, teach Hebrew School, and lead services and Torah study. I am grateful to all of you and our Temple board for the opportunity to engage in statewide and national work. This helps to bring the voices of small congregations to our national leaders and connects us more closely with our national organizations. For me, this is part of what is important about being part of a national movement. We are able to learn from others and have a say in what we do nationally. Perhaps most importantly, we can share with them all of the wonderful work we are doing. As the weather outside is (finally) changing, we also experience changes in our liturgical and ritual life. We end our summer prayers for dew and move into our winter prayers for wind and rain on Shemini Atzeret, the eighth day of Sukkot. (The holiday of Shemini Atzeret is more complex than it seems, as those of you at our morning Simchat Torah services figured out!) After a busy month of Tishrei, we enter the month of Cheshvan, the only Jewish month without any holidays. Here we reestablish (or perhaps learn to appreciate once more) our weekly ritual of Shabbat. As the days get shorter we anticipate the celebration of Hanukkah, our holiday of light when we are able to find holy sparks during even the darkest days of the year. In Judaism, these changes are viewed as positive and are ritualized. Our youngest class just learned about the shehecheyanu prayer. This prayer not only marks events that are unique, but also those that are cyclical. We say it every year at holidays, at the start of school, or at the first snow. This emphasizes our joy and thankfulness at returning to the same point in our yearly cycle once more—a little older, and perhaps a little wiser, experiencing a familiar ritual anew because we are at a different place in our lives. The circular reading of our Torah cycle, going from the last verses of Deuteronomy directly to the beginning of Genesis ritually emphasizes our often unnoticed transition from one year to another. As we journey into winter we anticipate our upcoming seasonal Temple events—our Chanukkah party, the (20th!) Ice Storm Wine Tasting, and Shabbat in the Wild—with joy. May you find this year’s cycle a fulfilling one, appreciating familiar rituals and discovering something new. It’s true that the timing of Sukkot is less than ideal. I have often thought that if this beautiful fall harvest holiday did not have the misfortune of falling on the heels of the High Holidays then it would be one of our most widely celebrated festivals. Sukkot is a natural fit for Mainers. Do-it-yourself building? Check. Time outdoors? Check. Harvesting crops? Check. Craftiness? Check. Sukkot is definitely a Jewish holiday made for Maine! After a week of praying and reflection, Sukkot offers us the chance to stretch our legs and venture outside. We are encouraged to share meals with friends, spend time in nature, and appreciate the bounty of the earth. With the fall days finally getting cooler, Sukkot is also a reminder of the coming winter and how privileged we are to have safe and warm houses. This holiday is known as zaman simchateinu, the time of of our rejoicing. How amazing that we have a holiday dedicated to joy! Many of you told me after services on the holidays how glad you were that you came. I hope that despite any “synagogue fatigue” you might feel you’ll join us to celebrate Sukkot as well. We’ll gather together Friday the 6th at 6pm for a potluck dinner in the sukkah and have an all-ages service at 6:45pm (Note the new times). On Saturday, Rabbi Susan will lead Torah study followed by a meal in the sukkah. On Wednesday, October 11th, we gather for interfaith study in the Sukkah at 11am and that evening we’ll have a pizza dinner followed by a Simchat Torah celebration. Plus, our sukkah will be up all week. Come by and sit for a few minutes or take your lunch to the sukkah one day. I hope that no matter how you celebrate Sukkot it is a time of rejoicing for you. Americans recently were captivated by the solar eclipse. For a few hours, we forgot the difficulties that are facing us and our nation. As we head into this High Holiday season, I know that many of us are troubled by the hatred we have seen manifest on our streets, and we worry about thousands of Texans devastated by flooding. This is the Hebrew month of Elul, a time of reflection and introspection. We will have time this month to come to talk about these somber and important events and to reflect on how we want to change ourselves in the year to come. I want to share with you some remarks I made in Portland at the March Against Racism. I was honored to speak there and it was wonderful to see so many Jewish people in the crowd. One of the most gratifying things about the rally was that so many of the speakers explicitly condemned antisemitism. For my entire adult life, I have been marching, writing letters, canvassing, and speaking out against injustice. That work has involved working with those affected by racism, homophobia, and anti-Muslim and anti-immigrant sentiment. Never before has that work involved antisemitism. Now it does. At a time when many of us are feeling increasingly vulnerable, it is heartening to know that we have many allies who will stand by us just as we stand by them. We are here today to stand against racism, against white supremacy, against hate. But more importantly, we are here today to stand for a different vision of America. What we saw in Charlottesville was an angry, hateful vision of America, a torch-lit America of anti-Semitic white supremacists hoping to divide us along lines of race, religion, sexuality, and national origin. What we see here today in Portland, what we saw yesterday in Boston, what we see rising up all across our country is a very different America – an egalitarian America, an inclusive America, a diverse America committed to the ideals of equality and justice that our nation has never fully achieved but must continually strive toward. We are here today because we are determined, resolute, and strong. We will never go back to the days when racism, sexism, homophobia, and anti-Semitism were considered normal and acceptable. We will never forget the horrors of slavery, segregation, and discrimination. We will never allow our country to be controlled by white supremacists. Never! We are here today because this is our state, this is our country. We are Maine, we are America – black, white, brown; Jew, Muslim, Christian; native, immigrant, refugee; gay, straight, trans; and everything in between – we are all one people. That diversity, that kaleidoscope of colors and backgrounds and experiences – that is the strength of America, that is the strength of Maine. We just finished up a fabulous week of Funtensive with more 30 kids from all over Maine joining us at Temple Beth El for five days of songs, Hebrew, games, art projects, and more. We learned about the Jewish calendar and Jewish holidays. While there were many highlights for me, perhaps the best part was our kids forming friendships with Jews from all over the state. At the beginning of the week, the kids tended to stay close to those they knew already, but by the end of the week it was hard to tell who was from which community. It was a treat for them to learn and play with so many new friends. We are looking forward to another week of Funtensive in July! Many of you also joined us for the fourth annual Maine Conference for Jewish Life. The Conference is Funtensive for grownups—Jewish learning, singing, and lots of time to socialize. I know for many of you, it is a highlight of the year to meet and learn with Jews from all over Maine. I love returning each year to see people from other communities and catch up with all of them. Mark your calendars for next year’s Conference: June 8th-10th at Colby College in Waterville. Todah rabbah to Amy Bley and Mel Weiss for being such amazing partners for Funtensive and to Mel Weiss, Rabbi Rachel Isaacs, and the Center for Small Town Jewish Life for an incredible Conference. At a time of great uncertainty and frustration in our state, I find hope in the way that our Jewish community comes together to learn from one another and strengthen one another. In this week’s Torah portion, we read that Baalam blesses the Israelites Mah tovu ohalecha ya’akov mishk’notecha yisrael/How fair are your tents, O Jacob, / Your dwellings, O Israel” (Numbers 24:5) Midrash teaches us that Abraham and Sarah’s tent was open on all sides, welcoming all who wanted to enter. Our new terumah system is a more transparent manifestation of a value that we have long held as a congregation—that our “tent” is always open to all who want to enter. May we continue to create a state-wide community where we can be stronger when we work together. May we always be a Temple community that warmly welcomes all who want to join us. There is so much happening at Temple Beth El! During a regular week, we will see Friday night services, Hebrew School, Saturday Torah study, volunteering at Addie’s Attic, and choir rehearsal. Add to that our book club, Nosh N’Schmooze, teen group, caregivers group, Capital Area New Mainers Project volunteers, and special events and you can tell this is a busy place. Not surprisingly, most of these activities draw a similar group of people. Parents of Hebrew School kids see one another on Sunday mornings, but rarely know the Shabbat crowd. Even Friday night regulars might not know those who attend Saturday morning Torah study. I am surprised at how often I find myself introducing two Temple members who are very involved in different aspects of our congregation. This summer, I am glad we have a few events that bring together the whole Temple community. The first is our Annual Meeting on June 4th, which is taking place during the last day of Hebrew School. Parents, please join our annual meeting while your kids are with their teachers. Then everyone, adults and children, can eat together at 11:30. We are planning two more Shabbat services on the lake this summer, tentatively scheduled for July 14th and August 18th. These services are perfect for all ages. I hope you will take advantage of summer in Maine and join us for a beautiful outdoor service. Finally, we are planning a BBQ, havdallah, and bonfire (with s’mores) for Saturday, August 12th. This is geared to all ages. We are looking for a few people who can bring their grills to the synagogue so we can cook and eat outside. Let us know if you can help. Our vibrant community is strong in many ways. One of the best parts about summer is welcoming back our summer residents to their home at Temple Beth El. I hope this summer will be a chance for you to meet some new people and get to know them better. Together we can build an even stronger temple community. Not surprisingly, there was plenty of ideas, but we all agreed that we cannot define Jewish as any one thing. Looking for intellectual stimulation? Saturday morning Torah study is for you. This month, we also have a talk about Anne Frank by Dr. Anthony Wexler and special study for Shavout. Want a chance to honor those in your family who have died? Come to our yizkor services to remember your loved ones. Interested in Israel? Our book club is reading Pumpkin Flowers and discussing modern Israel. Want to volunteer? Lend a hand at Addie’s Attic or with the Capital Area New Mainers Project. I could go on — I have not covered nearly all we do in a month! This partial list demonstrates all the amazing activities we have going on at the Temple. I urge you to try one new activity this month. And, if you want to do something you don’t see on this list, start your own group. There are many ways for us to be Jewish. As you can tell by looking at what we offer, we as a synagogue community support you whatever your connection to Judaism. All we need is for you to be involved! I just returned from an uplifting four days with Reform rabbis from across North America and Israel. The Central Conference of American Rabbis Conference, held this year in Atlanta, is a time for my colleagues and I to gather to pray and learn together as well as to engage in conversation and companionship. I wanted to share several highlights of this year’s conference with all of you. 1. Gathering for rabbis of small congregations: I attended two gatherings especially for rabbis of smaller congregations to talk about the joys and challenges of a life in small congregations. I am particularly excited to be working with colleagues on our music at services. 2. Learning opportunities: It was wonderful to be a student again. I attended fabulous sessions on ethics, the codification of the Torah, texts about immigrants and refugees, antisemitism, and more. We learned from amazing speakers, including Dr. Cornell Brooks, president of the NAACP, Dana Bash of CNN, and Joseph Levin Jr., co-founder of the Southern Poverty Law Center. 3. A chance to learn about synagogues in the Atlanta area: I learned how synagogues in the Atlanta area are building connections with the mayor, city leaders, and the interfaith community. It was inspiring to see their work, including a joint choir from The Temple (that is its official name!) and Ebenezer Baptist Church. It also made me appreciate all the work we do in our local community. 4. A chance to reconnect with colleagues: Informal conversations with colleagues gave me new ideas and energy. One hallway conversation led to resources for our committee planning a new dues structure, another led to ideas about adult education. I have many new ideas thanks to some time talking to my creative colleagues. 5. My first CCAR Board Meeting: It was an honor to be formally installed as a board member at Monday morning services and to attend my first in-person CCAR board meeting. I am looking forward to learning a lot as I join with thoughtful colleagues in guiding our conference over the next two years. I am grateful for the opportunity to serve and excited to be working with our wonderful professional staff and the new CCAR president. Much as my conference was an uplifting experience, I hope you are uplifted by your engagement with our community. I look forward to seeing many of you as we celebrate Passover together. Whether you are near or far, the board and I hope that you feel Temple Beth El is a place for you to learn, meet with friends, and connect with our community. While Purim is a minor holiday, it is really, in my opinion, one of the best celebrations of the year. We get to dress up (who doesn’t love costumes? ), eat delicious food, give gifts to others, retell the Purim story (which is a great one! ), and have fun. Seriously, this is a holiday where we are commanded not to be serious. Many of us think of Purim as a children’s holiday. Sure, we all like to eat hamentaschen, but we often think that dressing up and general merriment is just for kids. We tend to watch the children get a little crazy without partaking in the levity ourselves. But this standoffishness is precisely why adults need Purim! We all need to loosen up a little bit, whether or not we have school-aged children. Kids find plenty of opportunities for craziness. They don’t need a special holiday to explore their silly sides. We grown-ups, however, have fewer opportunities to lose our inhibitions, be crazy, and believe in miracles. This year, we need Purim more than ever. Anti-Semitism is on the rise, in our nation and across the world. There have been more than 90 bomb threats at American Jewish institutions, mainly preschools, in the month of February alone. Two Jewish cemeteries have suffered vandalism. No matter how safe we feel individually, such acts of hatred have a psychological impact. The Purim story reminds us there were other times in our history that were dark and difficult and that we were able to come out on the other side. This holiday gives us a chance lay our fears aside temporarily and spend a night laughing deeply, enjoying a party, trying on a new persona, and giving to others. I hope you will join us for our Purim celebration on Saturday the 11th at 7:00pm (geared to adults and teens) and/or our Purim carnival on Sunday the 12th at 10:00am. Saturday night will feature a klezmer band made up of Temple members, specialty cocktails, song parodies, and more. Sunday morning will feature our Purim play, carnival, and hamentaschen. Dust off your costume and we’ll see you there! Shakespeare wrote, “A rose by any other name would smell as sweet.” In other words, it is not a person’s name that matters, but his or her inner being. While this is a wonderful piece of poetry, it does not exactly ring true to us. We have a feeling that names matter, and they do. Judaism recognizes that outward appearances are not everything and, at the same time, we place a lot of importance on names. Our biblical texts show us the importance of names. We are currently reading the book of Exodus, where God establishes a covenant with the Israelites. The text tells us that previously God had been known as Elohim (to Noah) and El Shaddai (to the partriarchs), but now God would be know as YHVH, the mystical tetragrammaton. God enters into a new covenant with all the people and is known by a new name. Our ancestors also changed their names. Abram becomes Abraham and Sarai becomes Sarah when God establishes a covenant with them. Later, Jacob is renamed Israel after he wrestles with a mystical throughout the night. Joseph is given an Egyptian name, Zaphenath-paneah, when he is made second-in-command by Pharaoh. These names of our biblical ancestors have meaning to them and signify who they are and what they value. Our names, whether Hebrew or English, also have value to us. At Tot Shabbat, our youngsters shared the origins of their names. Several were named for family members or friends. One student’s name was even revealed to her father in a dream—very biblical! Several of our students did not yet have Hebrew names and we worked to find a name with meaning to them and their family. You might think you are never going to change your name. After all, who wants to go through all the paperwork? However, changing your Hebrew name or acquiring one for the first time is not a difficult task. Please let me know if you are interested in finding out the meaning of your Hebrew name or acquiring a Hebrew name for the first time. This month I had the opportunity to attend Symposium One at Hebrew Union College-Jewish Institute of Religion in New York City. For two days, I and other Jewish professionals and lay leaders explored the theme of “Faith and Fundamentalism in a Changing World.” Especially interesting were questions and discussions about how we foster a vibrant progressive Jewish culture through new forms of art, prayer, poetry, and Jewish law. Why is a creation of a vibrant Jewish culture so important? One of the conference speakers, Alana Newhouse, founder of Tablet magazine, explains: “From the very beginning, there was a tacit agreement made between this country and its Jews: You, America, give us liberty and freedom from the extreme degradation and oppression we experienced everywhere else and, in turn, we Jews, will gift you with our. . .Jewishness. With Jewish thinking and Jewish reflexes. With the ideas and impulses, honed over thousands of years, that could help a country create an unmatched economy, unparalleled creative industries and artistic and literary cultures, social and civic organizations, and more. America, at least so far, has kept its side of the bargain. But we have not.” Newhouse argues that it is our responsibility as Jews and as Americans to foster this vibrant culture. So, what, concretely, does this look like at Temple Beth El? In the coming months look for some new additions (and subtractions) to Shabbat worship, some new discussions in some of the ‘sermon slots’ for Friday night, and community-wide conversations of our customs regarding ritual and worship. If you are not much of a service attender, which many of you are not, you may see some changes at our Hanukkah party, our Purim service, and our Passover seder. I welcome your feedback and ideas as we embark on a project to create a more vibrant Jewish culture here at Temple Beth El. At this season of darkness outside, we kindle the Hanukkah lights to remind us of the miracles that occurred so long ago. May we continue to light the candles of innovation, relevance, and meaning as we enter into this season. Just more than a week from today is Election Day. This year, Temple Beth El, is working in partnership with Reform congregations around the country to encourage voting in our own congregations, work for greater voter participation in this election, and protect the rights of all to vote. Why is voting an important Jewish issue? For a full discussion, you can review my Yom Kippur sermon, but the brief version is that we know too well what happens when we are not involved. Our own history shows that unrest and uncertainty can often lead to scapegoating and marginalization of the weak. Our ability to cast our ballots allows us to ensure that we choose leaders who represent our values. We are blessed to live in a democracy where every citizen is able to vote. Countless Americans marched in the streets, challenged poll taxes and literacy tests, and endured beatings, harassment, jail, and vilification to secure this right. On Yom Kippur, more than 35 congregants pledged to vote in this upcoming election, with many of them committing to volunteer for a candidate or issue of their choosing. We at TBE would like 100% of our congregation to vote. If you are voting (or have voted), please let me know so we can count your participation. I am proud that Temple members held four different voter registration drives to register new voters, help voters who needed to change their address, and informed voters about their polling places. We also co-sponsored a discussion and film about Question 3, which would require universal background checks on all gun sales in Maine. I know many of you have been volunteering during this election season and I encourage you to continue your volunteer efforts in this final week of the campaign. While many of us cannot wait for this election to be over – it has been stressful! – I actually think this is an exciting time for us and our country. We have spent a large part of our history without the right to have our voices heard. We know how it feels not to be able to control our own lives. Today, we live in a country where we have the ability to express our political views, engage with other citizens about issues that matter to us, and decide who will represent us in our cities, in the state house, and in Washington, D.C. No matter what the outcome, our ability to be involved is a blessing. Rabbi Laura Novak Winer offers the following blessing for voting. I invite you to use this blessing at the voting booth. she–me׳tzapeh me’itanu l’asok b’avodat ezrachut ha’medina. who expects us to engage as citizens in our country. Postscript: For those who feel troubled by the divisiveness of the current election, I invite you to an interfaith service of healing and hope on Tuesday, November 15th (one week after election day) at 7pm at the UU Congregation. Shana Tova Umetukah, a sweet and happy New Year to everyone. As we mark the beginning of 5777, we gather together to celebrate as a community. After this celebration comes a time of introspection. The period between Rosh Hashanah and Yom Kippur is known as aseret yemei teshuva, the Ten Days of Repentance/Return. During this time between Rosh Hashanah and Yom Kippur, we are supposed to look back on our deeds over the past year, to do the work of asking for forgiveness and turning towards a better path. The mood is continued into Yom Kippur, a day when we ask forgiveness for our sins. For many, Yom Kippur is a meaningful, if not fun, holiday. It is a time to see where we have gone wrong and how we would like to change. But in our eagerness to change our path, we sometimes miss acknowledging all the ways in which we have done well in the past year. Rabbi Joseph Telushkin has written a prayer, “For the Mitzvah we have Performed.” I hope that reading a small part of it inspires you to continue on all your good paths, even as you think about how you would like to change. Kavod (respect) is the first value that we focus on with our Hebrew School each year. Respect is the foundation on which we build our school culture and undergirds so many of the other values we study. Hachnasat orchim (welcoming guests), bikkur holim (visiting the sick), shomrei adamah (taking care of the earth), and more all require a basic level of kavod, respect, for ourselves and for others. As we enter into a new school year and prepare to enter into a new Jewish year, it is a good time to recommit ourselves to practicing kavod in our own lives. As we look around our world, it is easy to see a breakdown of civility, a lack of kavod for those with different opinions, different racial backgrounds, different sexual orientations. At Temple Beth El, we always have prided ourselves on being an open and inclusive community. We come from all different backgrounds–from traditionally observant to humanist secular to classical Reform and everything in between. We have a racially and politically diverse congregation, but we have learned how to become a community together. The kavod we show for one another, even if we might have different viewpoints, is part of what makes us a welcoming community. As we enter the month of Elul, a month of introspection and preparation for the High Holidays, we should take some time to focus on the value of kavod within ourselves, within our congregation, and in our actions in the larger world. Kavod does not mean agreeing with everything someone else says, but it demands that we recognize the humanity in all whom we meet, even if – especially when – we strongly disagree. It means being willing to hear another side and to share our own feelings with civility. It means putting up with a noisy child during services or recognizing that changing traditions within a congregation may be difficult. It also means respecting our own needs. As we enter into this month of Elul, may we recommit ourselves to demonstrating kavod in our own lives every day. It’s that time again. No, not the hottest days of the summer, not the presidential election, but the Olympics! From the time I was a little girl, I have loved watching this contest of skill, strength, and speed. Every four years I would be glued to the television, learning the stories of the athletes and watching as the contests unfolded. So, what is Jewish about the Olympics? Well, Judaism places a deep value on the health of our bodies. Each morning, there is a prayer traditionally said upon waking, thanking God for our bodies working in the ways that they should. We give thanks to God for our health. As we watch the great athletic feats, we marvel at the miracle of our creation and the amazing heights to which our bodies can soar. In the modern era, Jewish competition in sports was especially important. As we moved out of the ghettos, we sought to shed the stereotype of the “bookish Jew.” Sports were a way for Jews to show their patriotism for the countries in which they lived. This ethos was also important for the early chalutzim (pioneers) in Israel who took pride in working the land. Israel has competed in the Olympics since 1952 and has taken home seven medals, including a gold medal in sailing in 2004. The United States has had many Jewish athletes, including Mark Spitz, the first Olympian to win seven gold medals in a single Olympic Games. He competed in Munich in 1972, the same Olympics where eleven members of the Israeli Olympic delegation were murdered by terrorists. Jewish athletes have competed and won medals for more than twenty countries. athletes, including Jewish two-time Olympian Aly Raisman. It’s a wonderful way to relax at the end of the summer and to follow some inspirational stories. I hope you have a relaxing end of the summer and find some time to enjoy the 2016 Olympics. June 1, 2016: Don’t overlook Shavuot! One of my favorite texts to study with people is the very first mishnah, Berachot 1:1. The mishna addresses the question of the time frame for saying the evening Shema. When, exactly, does evening begin, and when does the nighttime end? The mishna demonstrates the rabbi’s ties to the Temple, the definition of a halachic hour, and even contains a story. But more than that, I love it because it illuminates insight into human nature. The mishna tells us that although we technically can recite Shema until the very beginning of the next day, the sages say that we must recite it before midnight. This is to “distance us from transgression.” In other words, the sages know that if they tell us we have until dawn, we will put it off. We’ll fall into bed exhausted and promise to wake up early the next morning to recite Shema, but we will not get up. They give us an earlier deadline because they know we like to push boundaries. We are likely to stray into transgression. While this might apply in all areas of our lives, the rabbis were particularly concerned about observance and study. Hillel said, “Do not say when I have leisure I will study, for you may never have leisure.” (Pirkei Avot 2:5) Our robust Torah study group and vibrant Hebrew School demonstrates that many of us make the time to study. We Jews are not called the “people of the book” for nothing! In our yearly calendar, however, our holiday of study, Shavuot, often gets short shrift. While we theoretically are supposed to build up from Passover to Shavuot, today Passover is the star. Shavuot, a holiday where we celebrate the receiving of the Torah, is often overlooked. But it does not have to be. I hope you’ll join us for our Shavuot celebration on Saturday, June 12th. You’ll have the opportunity to study with Rabbi Susan, Jay Franzel, and me — and to eat some delicious dairy desserts. And on Sunday, June 13th, we’ll have a combined festival service (with yizkor) with participation in our Hebrew School. Finally, we have another great opportunity to study at the Maine Conference for Jewish Life June 17-19. I hope you’ll come one day or all three to learn and celebrate. The time is now! Too much recent political rhetoric has been marked by fear, suspicion, and hatred of the ‘other’ — we hear calls to register Muslims, patrol their neighborhoods, monitor their houses of worship, and even ban them from immigrating to our country. The rhetoric has become so toxic that even here in Augusta, the Iraqi Muslim community has felt compelled to reach out to the interfaith community to assure us that they are not terrorists, that they are good people just seeking a better life for themselves. These heated cries stand in stark contrast to the biblical injunction, “You shall not oppress a stranger, since you yourselves know the feelings of a stranger, for your were also strangers in the land of Egypt” (Exodus 23:9). This dictum is repeated more than any other commandment in the Torah. Why? As we move away from Egypt, as we integrate into American life, as we prosper, we may forget what it was to be a stranger. We do not remember what it is to be new—a new resident, a new citizen. We forget what it is to speak a different language, to have a different culture, to be looked at with suspicion. So, the Torah reminds us to remember. Passover, too, is a reminder of our ancient past. But more than that, it is a challenge. We say at our Passover seder, “Let all who are hungry come and eat; all who are needy come and celebrate Passover.” However, when we look at around our festive tables, most of us do not see any hungry or needy. We see a collection of family and friends, many of whom we have been celebrating with for years. The story of the seder is supposed to viscerally bring us back to our slavery, to have us relive what it is to be a stranger. Yet, we enact this ritual at tables without the hungry or strangers. Our actions speak for us. This Passover, we can take a stand against hatred and begin the process of building relationships with those who are different than we are. This Passover, we can invite someone new to sit at our tables with us. A newcomer to our community, a new acquaintance or neighbor, someone of a different religion or race. This Passover, let us open not just our hearts, but our homes to others in our community. This way we will not only remember our own time of being a stranger, but work to bring modern day strangers a little closer to the center of the community. By now we know that no one from Temple Beth El won the latest Powerball drawing for $1.5 billion. It’s too bad because the board was really looking forward to its winter retreat in Barbados. I’m sure many of us spent some time daydreaming about warm vacations and many other things that we would do with all the money. Some us might have even given some serious thought to the new lives we would live with hundreds of millions of dollars. For those who have enough financially, the prospect of more money raises an interesting question. As my husband challenged me, “If you would change your life if you had more money, then maybe you should think about changing your life now. Why wait?” His question is a good one. What is stopping us from living our lives so that they reflect our priorities and values? If unlimited money means we would quit our job, then maybe our work is not meaningful to us. If the prize means we would give more to charity, we might want to live those values more often (even if we do not have as much money as we would like). If it means taking a trip we always wanted to take, maybe we should start saving and planning to make that dream a reality. We certainly want enough money to live comfortably, but the “Powerball conundrum” raises an interesting question: Are we doing what we want to with our lives? If not, what changes can we make to ensure that we spend our time meaningfully, even if we do not win the lottery? May this new month be a time where we can be more ourselves. Even if we did not become wealthy overnight, living a life of integrity and meaning is one of the most precious prizes we could have. The truth is, with the right winter gear, I actually love winter. I like the crunch of the snow underfoot, seeing animal tracks in the woods, watching my children shout with joy as the careen down the sledding hill, and even partaking in some sledding runs myself. Where some people see freezing temperatures and short days, others see the opportunity to experience all four seasons, and a chance to curl up by the fire. Unlike happiness, which is external, joy is an internal state. Some people have more of it than others. Our task this month is to cultivate our joy. Joy has an important place within Jewish tradition. The psalms proclaim, “Worship Adonai with gladness/come into God’s presence with shouts of joy (Psalm 100:2).” Our siddur (prayer book) contains blessings for “daily miracles.” At first this feels like a misnomer. How can miracles happen every day? This prayer calls our attention to everyday occurrences which we take for granted, but which are truly miraculous—being able to get up each morning, being free, being made in the image of God. It is about reframing our expectations. Miracles and joy are all around us, but we must look for them. Living joyfully is particularly emphasized in the Hasidic tradition, which focused not on punctilious observance of the law (although that was important), but upon serving God with gladness. Hasidim practice simchah shel mitzvah, the “joy of the commandments,” finding happiness in prayer, holiday celebrations, and acts of kindness towards others. Joy is a eulogy virtue which helps us make the most of the life we are living. Spend a day with a child and you will see them experience true joy at the little things, getting a treat in their lunchbox, a little extra time to play at the park, cuddling with a parent or mastering a new skill. As we grow into adults we become buried in busyness and we often leave behind our sense of wonder and joy. Judaism is a religion which focuses on this world. When we find joy, we not only become happier people, but also serve God better. “This is the day that Adonai has made—let us exult and rejoice on it (Psalm 118:24).” What better way to fully practice our faith than to find joy in our daily lives? Are you a person who naturally finds joy or one who has to struggle to find joy? What are two things which make you most joyful in your life? What can you do in the coming month to find even more joy in those things? What mitzvot give you joy or do you think could give you joy? This month, try to do one mitzvah joyfully. Report back to your partner next month. David Brooks writes, “Joy is a byproduct experienced by people aiming for something else, but it comes” (The Road to Character, 2015, p. 269). He contends that in cultivating other virtues we will find joy, but that joy should not be something we seek by itself. Do you agree or disagree? How can cultivating other virtues help you find joy? Is there a danger in seeking joy for its own sake? People ‘from away’ often ask me what it is like to live in a place with so few Jews. Family and friends from Boston or New York cannot imagine how one survives Jewishly in a place like Maine. Do we really have a synagogue? Are there any other Jewish people? Where do we get bagels? Okay, that last question is easy, but others can be more difficult. Living in Maine means being a religious minority, plain and simple. But I, and all of you, have discovered many wonderful things not just about where we live, but also about being Jewish in Maine. I want to share with you a few highlights from the past month (and previews of the month to come) to remind all of us why our corner of the world might be even better than Boston or New York. The past several months, we have had a renewed interfaith presence in the Augusta area. Most recently, Temple members participated in “Lighting up Augusta with Hope and Love,” a gathering on the Memorial Bridge to stand against divisive and hateful rhetoric and for embracing and celebrating our differences. Temple members helped Artists Rapid Response Team (ARRT!) create a beautiful banner for Mainly Groceries highlighting the importance of all religions. Our annual Martin Luther King, Jr. program in Winthrop will highlight stories of immigrants and focus on how we can be a welcoming community (see pages 8-9). The Jewish community is an important and valued member of our religious community here in Central Maine. I am looking forward to what 2016 will bring. Being a minority means that we have the opportunity to educate others about our religion and often give them their first real taste of Judaism. Thanks to Temple member Stephanie Ward, I was able to speak at Mount Blue High School this past month as a wrap-up to the students’ reading of the book Night by Elie Wiesel. The students asked thoughtful questions and it was a pleasure to have a discussion with them. We Maine Jews know how to get out into nature. I hope many of you will join us for Shabbat in the Wild on January 23rd (see page 6). We appreciate the beauty of nature we see all around us, and this annual chance to worship and hike together is a perfect way to do just that. Stay for the potluck following. Out of ice storms we make wine tastings! This community loves to be together and the annual wine tasting does that and more (see page 4). It includes excellent food and quality wine, all carefully selected by our Temple sommelier, Syd Sewall. I hope to see many of you there on January 23rd! One candle that we have seen this past month is the increased activity of the interfaith community in Augusta. More than 70 people gathered at Temple Beth El for an interfaith Thanksgiving service. The service was co-led by people from nine different religious traditions. Instead of doing a “traditional” Thanksgiving service with poems and readings from each faith, we chose to explore the history of the native peoples in our country and to acknowledge the pain that they have endured as a result of our settlement. This event was meaningful for all who attended and is just one way that we are working together as an Augusta faith community. Another candle is the vigil outside of the Blaine House last week attended by 13 Temple Beth El members. We joined 90 other people to say that we welcome Syrian (and all) refugees into the state of Maine. In this time of heated rhetoric, it was a wonderful opportunity to come together and stand for an open, welcoming and tolerant state. Temple members Bob and Noah Katz were even interviewed on a local television station about their participation! Finally, our candle was lit when we gathered with family and friends to celebrate Thanksgiving this past weekend. Hopefully it was as much a time of rest and rejuvenation for you as it was for me. In our busy lives it can be difficult to find time for being with one another. This holiday afforded many of us that time. You may notice that all of these candles are local. That is no accident. We should be concerned about events that happen around the world, but that concern should not overshadow what is happening at home. The sages tell us that our locus of concern should start with our family, our Jewish community; and our local community; only then should we branch out to the broader world. When we focus on our local community, we have the opportunity to make a real difference. Our lights are brightest the closer we are to the candles themselves. As we enter into the darkest time of the year, I hope you are able to find light in our wonderful Temple community and in the communities in which you all live. We are participating in the N.A.A.C.P.’s “America’s Journey for Justice” is, individually and as part of the collective of 140+ Reform rabbis, a giant step for Justice. This 40 day march from Selma, AL to Washington, D.C., with 5 final days in DC, focused on racial and structural inequality under the banner, “Our Lives, Our Votes, Our Jobs and Our Schools Matter,” is more than a Journey of many rabbis over 860 miles. With at least one rabbi marching every day of the American Journey for Justice, a sacred scroll of the Torah will experience the entire length of this journey. Our sefer Torah that teaches of our 40 year journey through the wilderness will accompany us on this 40-day journey for the justice our Torah demands. Why are we working for racial justice at this time? Why are we marching? We march because we say enough. Enough of the tragedies. Enough of the subtle and overt racism. Enough of standing by. We march not only in the name of those whose deaths woke up our nation’s consciousness, but for the millions of others whose loss of life, loss of home, and loss of dignity never made a headline. Our hearts break for the world as it is–parched by oppression–constant, crushing, and unacceptable. We remember the slavery and oppression that bloodied our own past even as we recognize the privilege into which many of us were born. We, therefore, march arm-in-arm with other people of faith in our humble attempt to live up to our tradition’s demand to be rodfei tzedek, pursuers of justice, equality and freedom. We feel called by our God, our tradition and our consciences to march. At the same time, we know that simply marching in this remarkable forty-day Journey to Justice is not enough. We march for the forty-first day, the one-hundred and twentieth, and the years and generations to come. We march, as our ancestors taught us, to get from Egypt—the world as it is, filled with injustice—to the Promised Land. We march toward a vision of this land’s promise: our world redeemed, overflowing with chesed, tzedek, umishpat—compassion, justice and righteousness. This innovative graphic has gotten a lot of attention recently. Created by the United Synagogue of Hoboken, it is based on a story told by Rabbi Art Green, a leading figure in the Jewish Renewal Movement. In Restoring the Aleph—Judaism for the Contemporary Seeker, he tells the following story. This season is a time for us to work on ourselves. But we cannot just be expected to jump into the internal work of the holidays on the 1st of Tishrei when Rosh Hashanah begins. Rather, we have the entire month of Elul to help us to prepare. During this month we traditionally sound the shofar to rouse us from our slumber. We also recite part of Psalm 27: “Adonai is my light and my salvation; whom shall I fear? Adonai is the stronghold of my life; of whom shall I be afraid?” (Psalm 27:1). This psalm gives us hope during the upcoming Days of Awe, when we think over our deeds from the past year and how we can do better in the year to come. If you have not started your preparations for the holidays, you still have a chance to get ready. About a week before Rosh Hashanah we have a special Selichot service. Selichot means forgiveness, and this observance includes the same confessions we recite on Yom Kippur. During this service we will also recite Psalm 27 and hear the shofar . This year our service will take place at 7pm on Saturday, September 5th. After our service and a brief dessert break, we will hear from three fascinating panelists who will discuss creation (more information on p. 4). 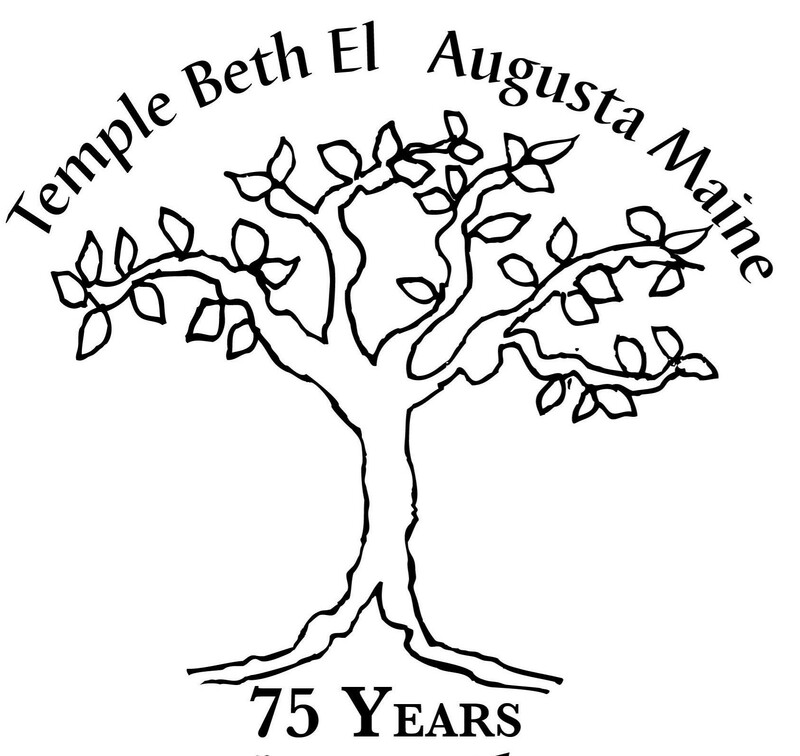 This year marks 75 years since the creation of Temple Beth El and 5776 years since the creation of the world. It is a chance for us to look back on creation, and think about what we want to create for ourselves in the coming year. It is time to get to work on ourselves. Summer is wedding season in Maine, and most of the people who get married in our state do not live here. When I ask couples why they are getting married in Maine, they invariably respond, “summer camp.” Maybe they went for a year or two, or maybe for their whole childhood, but those summers on our Maine lakes made enough of an impression for them to come back here to get married. Of course, living here it can be easy to take it all for granted. It’s not just that we see Maine in every season, or that we get inured to the beauty. Rather, we live our everyday lives here. Paradise is less romantic when you actually have to get that lake house and porch ready, when you have to do laundry and clean, and when you have to work during the days. The hassle and headaches of everyday life can make it difficult to appreciate what we have all around us. Judaism also recognizes our need to step out of our everyday routine and into sacred time, which we call kodesh, or holy. While the most common example is Shabbat, the ones that are celebrated more widely within Reform Judaism are the holidays. Rosh Hashanah, Yom Kippur, Chanukkah, and Passover offer us an opportunity to disconnect from our regular lives and enter a different space. This summer, when there is a dearth of Jewish holidays, I invite you to experience holy time, Maine Summer Camp Style. Join us for Shabbaton — an extraordinary Shabbat retreat at camp from August 28-30. You are never too old to go to summer camp — and you won’t even have to do any dishes! A poem by Hannah Senesh, a soldier killed in World War II. long, long after the star itself is gone. though their time with us is done. these are the lights that guide us. As we live our days, these are the ways to remember. Eloheinu v’lohei avoteinu v’imoteinu, Our God and God of our ancestors. We come together this Memorial Day to remember the light of those who served our country. Some we knew and loved; we feel their loss deeply. Many of the names on this monument were not people we knew. Many lived and died before some of us were born. That makes it even more important that we come here to day to honor their memories, to acknowledge the sacrifice they made and to offer thanks to them for their service. Whether we knew them or not, their lights shine still and those lives guide us through our lives. Passover, one of the most observed Jewish holidays, is almost upon us. While most of us are familiar with hosting or attending a seder, we give less thought to our Passover preparations. But Passover is not just about the seder. The preparations we make before the holiday begins can make our Passover even more meaningful. We have several rituals that help us to get ready for Passover itself. First, we are supposed to clean our house of all forbidden foods—anything made from rye, oats, barley, spelt, or wheat. These foods, when mixed with water, become chametz, or leavened. We do not have to clean our house of all dust, but do have to clean areas where we might find cookies, crackers, bread or other chametz. If your family is anything like mine, Cheerios are found almost everywhere (even in the car) so this requires some work. In addition to cleaning our houses, we traditionally put food that is not kosher for Passover away in a locked or taped cabinet, ensuring that we do not accidentally eat it. The night before the seder (Thursday, April 2nd) there is a tradition of going around the house searching for any chametz that is left. This is usually done by candlelight, but flashlights can also be used. Chametz is hidden throughout the house (cookies and doughnut holes help motivate searchers!). Before the chametz hunt, the following blessing is recited: Blessed are You, Lord, our G-d, King of the universe, who has sanctified us with His commandments and commanded us concerning the removal of chametz. Baruch atah Adonoi Eloheinu melech ha’olom asher kidishanu bi’mitzvotav vetzivanu al bi’ur chametz. These foods are traditionally burned the morning of the seder (Friday, April 3rd) before 11:30am. When we burn them we recite: All leaven in my possession, whether I have seen it or not, whether I have removed it or not, is hereby nullified and ownerless as the dust of the earth. We also do not eat chametz after 10:30 in the morning, allowing us to gradually move into our Passover diets. While some of us might have grown up with these rituals, my guess is that many of us (myself included) did not. So why should we include all the extra work of cleaning, searching, and burning? Isn’t it enough to just break out a box of matzah and get on with the holiday? While that is certainly easier, there is significance to preparing for the holiday. Just as we would not run a marathon without training, we cannot be expected to jump into Passover without some preparation. Passover requires a physical change of our houses and our diet, and also a spiritual change as we reenact the journey from slavery to freedom. Cleaning our homes and ritually disposing of our chametz helps us to make an inner transformation and get ourselves spiritually ready for the holiday. These preparations help us to enter into the sacred time of the seder in a more purposeful way. I invite you to incorporate one (or more) of these traditions into your Passover preparations this year. I think it will help you to have an even more meaningful seder and Passover holiday. With the start of the month of Adar, we feel a slow but steady growth in joy. When Adar started in mid-February, we did not see a decrease in snow or an increase in temperatures (30 degrees feels balmy, doesn’t it? ), but in the Jewish year our mood becomes more joyful as we celebrate Purim — a day of excess, of turning things on their heads, of wild abandon and joyful celebration. Giving gifts of food and drink to others (often including hamentaschen). Getting a little crazy (or as the rabbis say—so drunk you don’t know the difference between the wicked Haman and the good Mordechai). While getting into the spirit can be easy for some, it can also be difficult to act like a “joyous fool.” Purim is a time for us to experience ad de-lo-yada, a time when we act free of rules or inhibitions. This state shows us that it is easy to change from good to evil. The Talmud states that we fully accept Torah when we mock our traditions on Purim. If we cannot make fun of tradition, “we make the tradition into an idolatry rather than a smasher of idols, into frozen-in-stone dogma of what once was rather than a living faith,” writes Michael Strassfeld in The Jewish Holidays: A Guide and Commentary. This one day of breaking rules allows us to live by the Torah for the rest of the year. Purim is often viewed as a children’s holiday, but adults need more help in losing our inhibitions. Children joyfully dress up, play games, and act crazy all the time, while we adults often dread putting on a costume or acting silly. I encourage you, this year, to get a little crazy with us as we celebrate Purim beginning at 5:30pm on Wednesday, March 4th. We will be taking part in acting out the story of Purim, dancing to the fabulous music of the Phelps Family, eating hamentaschen, drinking, and generally having a good time. Sign up to bring something to share and bring a box of pasta for your grogger (we will then donate them to the food bank, fulfilling the third mitzvah of Purim). If you can’t find a costume at home, we will have a whole box of costumes for you to try on. See you there! After all, who doesn’t need a little joy in the midst of this winter? Jewish ritual and tradition can help us both appreciate life’s blessings and cope with life’s stresses. On Friday nights, Shabbat gives us a chance to relax after a busy week and enjoy time with family or friends. Our tradition of saying blessings each day helps us to focus on gratitude. Dietary restrictions help us to be more mindful about how and what we eat. In the past few months, I have been thinking a lot about Jewish mourning traditions, not only for families who have lost a loved one, but in terms of how the community is supposed to respond to a loss. Some of us might be familiar with the traditions of mourning. We customarily suspend all our regular activity for seven days, called shivah, and say kaddish for those seven days, usually at one’s home. Today, it is more common in many circles for the family to observe three days of mourning at their home. One mitzvah we as a community can do is to attend the shivah minyanim (the services for shivah). In a small community like ours this helps to ensure that the required minyan (ten people) are present so that kaddish can be recited. But even more than that, it shows the mourners that the community cares about them. Our presence is vital, even is we did not know the deceased, or do not know the mourner particularly well. Being part of a community means showing up, taking time out of our schedule to comfort the mourner simply by our presence. At times, we can be paralyzed because we do not know what we should do. If we do not know the mourner well we might wonder if we should even show up at all; if we do show up, we struggle with what we should say. If we know the mourner, we might feel that our words are inadequate or that we want to be doing something, but we are not sure what. Judiasm has a beautiful teaching to help us engage in the mitzvah of nichum aveilim, comforting the mourner. Our tradition says that we take our cues from the mourner. After entering the house and offering our condolences (often with the traditional phrase, “May God comfort you with all the mourner of Zion and Jerusalem”), we wait in silence and pay attention to the mourners. Some may engage us in conversation about their loved one or about the weather. Some may ask about our own families. Some may simply sit in silence. We follow their lead. As I explained to the Hebrew School students last month, sometimes when we are sad we want a hug, sometimes we want to do something to take our mind off our sadness, and sometimes we just want to be left alone. Sometimes, we may have all those feelings, and more, in a very short amount of time. There is no right or wrong way to mourn, but there is a Jewish way to comfort those who mourn. We take our cues from them and follow their wishes. We show up, at a shivah minyan if threre is one, or with notes or messages of support. We change our focus from what we think we should do to what the mourners would like from us. While we might not celebrate Shabbat, say daily blessings, or restrict our diets, unfortunately we will all have the opportunity to practice the mitzvah of nichum aveilim. It has been heartening to see this community show up for those who have suffered losses in the past few months. May we continue with this important mitzvah whenever it is needed. Over the past few months I have been reflecting on the unique aspects of life in a small congregation. Part of this has to do with the fact that we have had several new people come to TBE, and it has given me a chance to see the congregation again through their eyes. Also, for the past six months I have been active in forming a group of rabbis of small congregations to work within our rabbinic association, the Central Conference of American Rabbis (CCAR). We have scheduled a series of webinars specifically for small congregations. We are also working on sharing ideas and pushing for better leadership development and financial management resources. It has been gratifying to be a part of raising the profile of smaller congregations and to speak about our unique challenges and opportunities. As many of you know, there are some challenges to being in a small congregation. One challenge is financial. With the number of members we have, it is difficult to meet our budget. We are sustained by generous gifts from our members who can afford to give more and by numerous smaller donations from those who are not members. Many of you reading this newsletter are not officially members, but you give annually or send in donations for yahrzeits or High Holidays. We appreciate your contributions, which support our community and Jewish life in Central Maine. Another challenge can be finding enough volunteers to keep the synagogue running. Many of you have given countless hours over the years serving on the board, working on committees, organizing the Wine Tasting or Hanukkah party, helping with set-up and clean-up for events, singing in the choir, playing in the band, and much more. We might have even burned some of you out over the years! Thank you so much for all your hard work. running. This year we have a new member of the ritual committee and new people chairing our book fair and Chanukkah party. One new member is volunteering for an hour or two every month doing whatever we need. But we still need more help. If you have a couple of hours to give to TBE each month let us know. In the coming year we will need volunteers to stuff yahrzeit letters (about an hour a month), chair the Tu B’Shevat Seder (about four hours of work), help plan our Purim festivities (three to five hours), and chair our Passover seder (about 15 hours). We want you—especially if you have not had a chance to volunteer in the past. For all the challenges, though, there also are some wonderful aspects of life at Temple Beth El. We come together when we are needed. In particular, I am thinking of all those who came to the shivah minyans for Natalie Cohen. I sent one email to people in the Augusta area and we had more than a minyan at the Cohen household to partake in the mitzvah of comforting the bereaved—even on Christmas Eve. We also provide a warm welcome to everyone who comes in the doors. One new visitor to Temple Beth El shared, “From my experience, I have never felt so welcomed into a group since I moved to Maine. I really was surprised and impressed at how friendly people were.” Another new member was gratified to see how our membership application reflects our values of inclusion and acceptance (it lists Member A and Member B, and asks people for their gender or preferred pronoun). Being in a smaller community gives me a chance to get to know all of you, and for you to get to know one another. As we begin our secular New Year, I extend the invitation to any of you to meet with me individually—about something specific or just to get to know one another better. I also extend the invitation to become more involved in our community through volunteering or attending our many upcoming events (including the Ice Storm Wine Tasting and Shabbat in the Wild this month). Thank you for all that you do for Temple Beth El. We are all part of a wonderful community. “When Adam saw the day getting gradually shorter, he said, ‘Woe is me, perhaps because I have sinned, the world around me is being darkened and returning to its state of chaos and confusion; this then is the kind of death to which I have been sentenced from Heaven!’ So he began keeping an eight-day fast. But as he observed the winter equinox and noted the days getting increasingly longer he said: ‘This is the world’s course,’ and he set forth to keep an eight-day festivity.” (Avodah Zara 8a). Although Adam (and presumably Eve) learned that the days get shorter and then longer, they kept the tradition of their eight-day observance at the darkest time of the year. Even though we know that the days will get longer, the observance of the candles and the increasing of light feel particularly important during these long winter nights. The lights are for our spirit rather than for any functional purpose — we are not supposed to gain any benefit from the light of the candles, so we should not use the light to read by or as the sole source of illumination for a room. That is part of the reason that we use the shamash to light the other candles: if we used one candle to light the other candles, then we would be deriving benefit from them. This Chanukkah may we find the light within our own selves and within one another. May it illumine us and our world. We have just entered the Hebrew month of Cheshvan. Cheshvan has the distinction of being the only Hebrew month without any holidays, except, of course, for Shabbat. Because of this, it is sometimes given the name Mar Cheshvan–bitter Cheshvan. Indeed, this can be a difficult time of year. The days become shorter, it becomes dark even earlier, and the rain begins to turn to snow. However “bitter” this month may be, there is also joy in it. I recently saw a shirt that says “Rabbis Love Mar Cheshvan.” After the busy-ness of Tishrei. when we celebrate Rosh Hashanah, Yom Kippur, Sukkot, and Simchat Torah, it can be nice for all of us to have a little bit of a break. It gives us a chance to slow down, to reflect, to prepare. And this can also be a wonderful time of year as the last of the leaves fall and we witness once again the inexorable change of seasons. The cold weather gives us an excuse to burrow under the blankets and cozy up by the fire. Cheshvan/Mar Cheshvan reminds us of the duality of our own lives. Sometimes bitter events can have some joy in them. At other times our joy is marred by sorrow. As we go from Cheshvan into the lights of Chanukah in Kislev, may we, too, be able to see the joy. Our physical and mental health is something we too often take for granted until it is too late. Our morning blessings thank God for the wondrous gift of our bodies working properly. 1.Do I and members of my family regularly see a doctor for checkups? 2.Do I exercise regularly and walk when possible? 3.Do I eat healthy food and meals which are cooked at home? Many of us are blessed with financial health, but even if we subsist on public funds, we are obligated to give to others. Jewish tradition teaches that we are obligated to contribute to the soup kitchen, clothing fund and burial fund. 1.Am I in debt? If so, do I have a plan to pay off what I owe? 2.What percentage of my money do I give to tzedakah? How close am I to the recommended ten percent? 3.Do I give to people in my own city and to support those in need of basic sustenance? Family has long been the center of Jewish life. We are commanded to honor our parents, preserve family harmony in the house, and teach our children Torah. 1.Do I keep in regular contact with my parents and respect their wishes, even as they age? 2.If my parents are deceased, do I honor their memory by speaking of them respectfully? 3.Do I see my family in the mornings and sit down with them in the evenings – without the TV or the smartphone as distractions? In our busyness, we often forget to connect to God. Our relationship with God is a vital part of the High Holidays and of Judaism. 1.Do I attend services or pray outside of synagogue? 2.Do I have commandments which I feel obligated to follow and do I observe them? 3.Do I ask forgiveness at Yom Kippur and other times of the year? The 15-year-old girl approached the immigration officer. With her were her two younger brothers; her parents were somewhere over the border, waiting for her. She had traveled hundreds of miles to reach the United States, and she hoped that this was the start of a better life for her whole family. This unaccompanied minor was not from Central America. Her name was Annie Moore, and she and her brothers were Irish. They were the first people in line the opening day of the immigration station at Ellis Island on Jan. 1, 1892 — three of many unaccompanied minors who have come to our land seeking refuge and opportunity. In the past year, tens of thousands of unaccompanied minors from Central America have fled violence and poverty at home to seek a new life in the United States. More than 90,000 refugees are expected by September. Although we are more than 2,000 miles from the border with Mexico, we know that some of these refugees will end up here in Maine; to date, eight children have been placed in our state. As religious leaders, we are proud to welcome them. While our various faith traditions disagree on specific doctrines, we agree on many fundamental principles. All of our traditions teach us that we are called to “welcome the stranger” and provide “radical hospitality” to those in need. We remember Abraham and Sarah, who lived in a tent open on four sides so that they could extend hospitality to people who were passing by. We recall the Good Samaritan, who stopped when he saw a stranger in need, bandaged the man’s wounds and made sure he received the care he needed. Similarly, we believe that it is the right and faithful thing to do to embrace these children as we would our own. As the children await a final resolution of their status, we would like to assure them and their families that we welcome them and are ready to provide support during this difficult time. If they or any additional children come to the Augusta area, we invite them to worship with our congregations, to meet with us personally and to view our religious communities as places of support. We would like to assure their parents and loved ones in Central America that with us their children will find a place to which they can turn during these difficult times. We are heartened that all around our country, religious leaders and institutions are opening their doors during this time of crisis, working to assist refugees and to focus on the human need facing these children and their families. We, too, are from a variety of faith traditions: Baptist (the Rev. E Scott Dow), Catholic (Father Frank Morin), Episcopalian (the Rev. Rebecca Grant, the Rev. James L. Gill, the Rev. Alicia Kellogg, the Rev. David Matson), Jewish (Rabbi Erica Asch, Rabbi Susan Bulba Carvutto), Lutheran (the Rev. Erik Karas), Presbyterian (Pastor Rick Ness) and Unitarian Universalist (the Rev. F. Vernon Chandler, the Rev. Pam Gross, the Rev. Carie Johnsen). We are proud to add the religious voices of Maine clergy to this national call for humanity. We invite the residents of the Augusta area, no matter what their faith tradition (if any), to join us in extending welcome. We call upon on our elected officials to work to fix the backlog in our immigration system that often causes children and their families to live in limbo for years until their final status is resolved. We can only begin to imagine the horrible circumstances that would compel a family to send a child away in the desperate hope of protecting him or her. We pray that their parents know that their children are safe. We pray that these children may feel secure enough to tell the stories of the horrors they faced that caused them to flee — be it violence from drug cartels, forced prostitution, extreme poverty or murdered family members. We pray that these horrors may soon be resolved. But until that day comes, with the love and compassion taught in our various faith traditions, we welcome them and any more children who may seek refuge in communities here in Maine. Today, a statue of Annie Moore stands at Ellis Island, a reminder of the many unaccompanied children who sought refuge in our country. Near it stands the Statue of Liberty, which proclaims our own country’s vision of “radical hospitality”—”Give me your tired, your poor, your huddled masses yearning to breathe free.” May we all live up to that aspirational promise. I was recently asked to speak about the topic of “transformation” at a conference. In American culture, we often think of spiritual transformation as a quick process, something like, “God spoke to me and I changed my life!” But in Judaism we have a different model of transformation. We don’t have many get-transformed-quick examples in Jewish tradition. Most of our transformations are slow. Take, for example, Rabbi Akivah. He is best known for being one of the greatest rabbinic minds ever, a truly wise scholar who was one of the founders of rabbinic Judaism. But many people do not know that Akiva did not learn any Torah until he was 40 years old. In fact, he was illiterate. Akiva was a humble shepherd. He married Rachel, the only daughter of a wealthy man who hoped that his daughter would marry someone who was learned. She chose Akiva instead. She saw that he was modest and polite, and that he had common sense. She felt that if he could have the opportunity, he would be a great scholar. Rachel’s father disowned the couple and they struggled for many years. Rachel encouraged Akiva to go to the house of study and learn Torah. He did, though he stayed away for a total of 24 years. When he returned, the humble shepherd had 24,000 disciples with him. After more than two decades of arduous study, he had been transformed into one of the greatest scholars of his generation. As Akiva’s story shows us, in Judaism transformation can be a long, slow process. It takes a long time, sometimes decades, for us to transform ourselves. And it is hard work. Akiva had to start by learning the alphabet with students who were much younger than he was, but he persevered and was able to transform himself. One of our holidays of transformation is Yom Kippur. During this time we are supposed to take stock of our lives and think about how we would like to change. We are given the opportunity to begin the process of transformation. The Hebrew word teshuvah, often translated as repentance, literally means “to turn.” The process of transforming is about turning ourselves. This turning is not a quick or an easy process. Transformation can be difficult work. When it seems that our task is too difficult or too long, it is good to remember the story of Rabbi Akiva, who took 24 years of study to transform himself from an illiterate shepherd into a great scholar. It will take us some time to transform ourselves as well. May 5, 2014: Should we celebrate holidays on the day they actually occur? There’s a sign outside the Mexican restaurant in Hallowell: “Celebrate Cinco de Mayo with us May 3rd.” For those of you who did not grow up in Southern California, Cinco de Mayo literally means May 5th, so the sign says, “Celebrate May 5th with us on May 3rd.” Now, I understand that May 5th is a Monday, and they are going to get less business on a Monday than on a Saturday night. So, I don’t really mind that they moved the celebration. In fact, it makes me smile every time I drive by the sign. It’s not just Mexican restaurants that fiddle with holiday scheduling; the federal government does it too. In 1968 Congress passed a law to move Washington’s Birthday (now unofficially known as Presidents’ Day), Memorial Day, Columbus Day and other federal holidays to Mondays in order to increase the number of three-day weekends for federal employees. As a result, we tend to celebrate these as an extra day off, but we rarely take the time to remember the original intent of the holiday. Moving the holiday may be more convenient, but it undermines the point of the holiday in the first place. In Judaism we also see a tendency to celebrate holidays when then are convenient rather than when the actually occur. Some holidays are sacred. Shabbat is always Friday night and Saturday morning; Rosh Hashanah and Yom Kippur are never moved. Others, however, suffer from calendar drift, which happens both in our home celebrations and at our synagogue. Even Passover, The Washington Post recently reported, sees more and more Jews hosting their seders on the weekend in order to allow family and friends to join. Of course, as a minority, we have the problem that our holidays often fall during the week, which forces us taking off of work or leaving early to celebrate holidays. Many of those who live far away do not want to make a long drive into Augusta on a weekday. That is perfectly understandable. But there is also merit in celebrating holidays when then actually occur. Doing so connects us with our ancestors and Jews around the world in common celebration. In some ways, the very inconvenience of having to celebrate on a particular day makes us more likely to think about and honor the meaning of the holiday, rather than using it as an extra day to shop or take a vacation. There were several very animated discussions recently among my colleagues about scheduling holidays like Purim, Simchat Torah and Shavout on the nearest Shabbat. Most rabbis argued for keeping the holiday on the actual date. Some, like my classmate Craig Lewis, asked, “If you do a Hakafah in a temple and there is nobody there to dance, did the Hakafah really happen?” Our practice at Temple Beth El has been to keep most holidays on the actual date. This includes our community seder and yizkor. There has been a little bit more flexibility with Purim, Simchat Torah and Shavout. What do you think? Should we move some holidays to the nearest Shabbat or keep them on the calendar date? Email me at rabbiasch@gwi.net. I’d love to hear your opinions. This year, we will celebrate Shavout on its actual date, June 3rd and 4th. Join us at Colby College on the evening of June 3rd for kelzmer, Israeli dancing, dinner, kids’ programming, State Senate President Justin Alfond and learning. Register here — it’s $36 per adult and children are free (but write their names and ages in the “other” box so we know they are coming). We will also have services with yizkor on Wednesday morning as part of the conference with a great day of learning. You may download the schedule here. Scholarships are available. We want everyone to be able to attend this wonderful gathering! Early in April, I was lucky enough to attend the Central Conference of American Rabbi’s (CCAR) Convention in Chicago. The convention brought together 570 Reform rabbis from all over the world for four days of worship, learning, and reconnecting. My friend, Jessica Oleon Kirschner, observed that convention for us was probably like synagogue for many of our congregants. It felt like going home. Being a rabbi, especially in Central Maine, can be a lonely task. I am so grateful to my colleagues in the state, especially Rabbi Susan, who have welcomed me warmly into their ranks. But as wonderful as they all are, there is no substitute for being able to see people face to face. It was wonderful to catch up with my good friends from school, some of whom I had not seen in years. Over meals and between sessions we were able to listen to one another, offer support, advice, encouragement, and laugh with one another. Convention felt comfortable and familiar, filled with old friends and new acquaintances. For me, it was a place to feel at home, where we all shared a common language and set of values—from the rabbinical student to those who have been in the rabbinate fifty years (or more). I wanted to share a bit of what I learned from convention with all of you. 1. I was able to help lead a group for rabbis of small congregations. We discussed our similar concerns and decided to work together on lay leader development, resource sharing, and financial concerns. I am very excited that the CCAR leadership was responsive to our concerns and is willing to work with us on these issues. 2. I participated in meetings of Rabbis Organizing Rabbis (ROR), a project sponsored by Just Congregations, the Religious Action Center, and the CCAR. With twenty colleagues across the United States, I have been working on the issue of comprehensive immigration reform for the last year. We were able to celebrate some victories and discuss how to move forward. I’m excited to be co­authoring a Shavout teaching and ritual that will be available to all 900 congregations in North America to use during the holidays. 3. I found time to study with amazing teachers and have some time for Torah lishmah (study for its own sake). It was amazing to delve into rights of children, Reform responsa, and kaddish rituals at kibbutizm in Israel, just to name a few. 4. I am thankful for this amazing community, the board, and the rabbi committee. You all understand deeply what it is to support clergy. I am blessed to have the time I need for my family and for myself. This makes me a better rabbi.